Jonathan Harvey (1939-2012) was one of Britain's leading composers: his music is frequently performed throughout Europe, the United States (where he lived and worked) and Japan. He is particularly renowned for his electro-acoustic music, an aspect on which most previous writing on his work has focused. The present volume is the first detailed study of music from Harvey's considerable body of work for conventional forces. 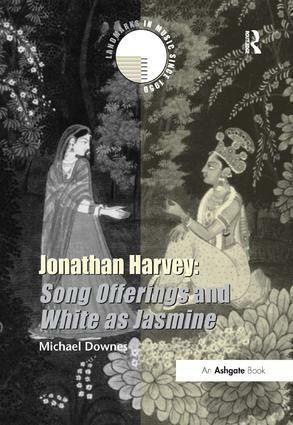 It focuses on two pieces that span one of the most fertile periods in Harvey's output: Song Offerings (1985; awarded the prestigious Britten Award), and White as Jasmine (1999). The book explores the links between the two works - both set texts by Hindu writers, employ a solo soprano, and adumbrate a spiritual journey - as well as showing how Harvey's musical language has evolved in the period between them. It examines Harvey's techniques of writing for the voice, for small ensemble (Song Offerings), and for large orchestra, subtly and characteristically enhanced with electronic sound (White as Jasmine). It shows how Harvey's music is informed by his profound understanding of Eastern religion, as well as offering a clear and accessible account of his distinctive musical language. Both works use musical processes to dramatic and clearly audible effect, as the book demonstrates with close reference to the accompanying CD recordings. The book draws on interviews with the composer, and benefits from the author's exclusive access to sketches of the two works. It contextualises the works, showing how they are the product of a diverse series of musical influences and an engagement with ideas from both Eastern and Western religions. It also explores how Harvey continued to develop the musical and spiritual preoccupations revealed in these pieces in his later work, up to and including his third opera, Wagner Dream (2007). Contents: Introduction; In quest: Jonathan Harvey's musical development from the 1950s to the 1980s; The approach to the absolute: metaphysical preoccupations in Harvey's music; Song Offerings (1985); White as Jasmine (1999); Towards pure lands: Harvey's music in the 21st century; Works by Jonathan Harvey; Select bibliography; Discography; CD track list; Index.